We’ve finalised our line-up of children’s activities for this year’s Proms & Prosecco in the Park and there’s plenty to keep the little ones entertained, even if they are not big music fans! We’ve invited back the innovative street performer, James Bazley who delighted children and adults alike at last year’s event. James will be working his way around the audience with his trunk of magic tricks and surprises! Additionally, we have Shrewsbury’s most treasured juggling unicyclist, Justin G showing the children how its done! 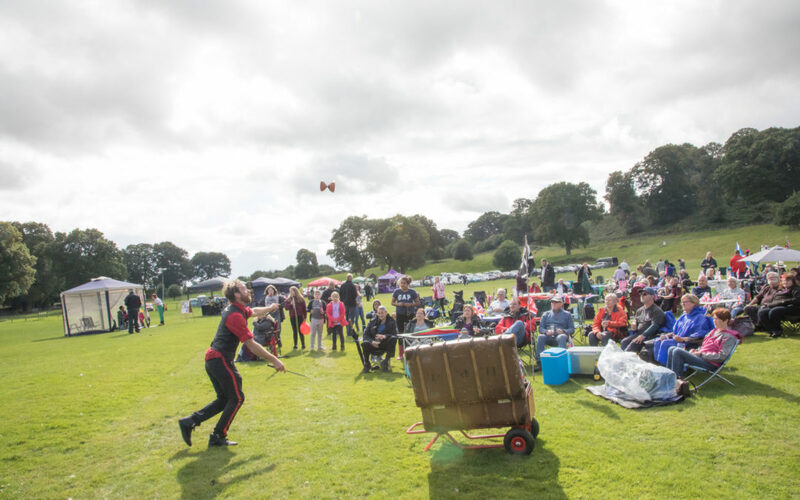 Justin entertains visitors to The Quarry in Shrewsbury every weekend where he practises his juggling skills and draws huge crowds. New for this year we have Immediate Care Medical giving children the chance to learn lifesaving skills with the assistance of ‘Flat Stan’ their lovely little CPR dummy. And if that’s not enough, we have den building and bush craft workshops from Outback 2 Basics. This brilliant Shropshire-based company gives children the opportunity to become the next Bear Grylls by teaching them how to make the most of the great outdoors and all that nature has to offer. We’ve also got henna artists, glitter tattoos and face-painting for youngsters that want to get right into the festival spirit! With six hours of live music, delicious street food, four bars, children’s activities and a Last Night of the Proms style finale, we’re confident there is something for everyone! Proms & Prosecco in the Park – Celebrating All Things British! Fireflies Festival – Fabulous Line Up Revealed!